Government officials and leading members of the trade also were in attendance at the opening of the revamped show which has been expanded with a new hall in the long-standing complex. The hall has added about 10,000 sq meters of space and provides room for an extra 800 booths. Officials said the expansion made it one of the world's top three jewelry shows. Around 40,000 visitors are expected at the show. The IIJS will host more than 1,300 exhibitors, with 2,500 booths and in excess of 35,000 pre-registered visitors. An industry machinery section is situated on two parts of the showground. Some exhibitors were upbeat about the August 9-13 show, saying there had been notably strong foot traffic on the first day, while others said business was in line with the first day of previous shows. "The jewelry business is good, and loose diamonds have seen a lot of inquiries," commented Vishal Zadafiya of Hari Krishna Exports Pvt Ltd. "The market overall is positive and today was good. 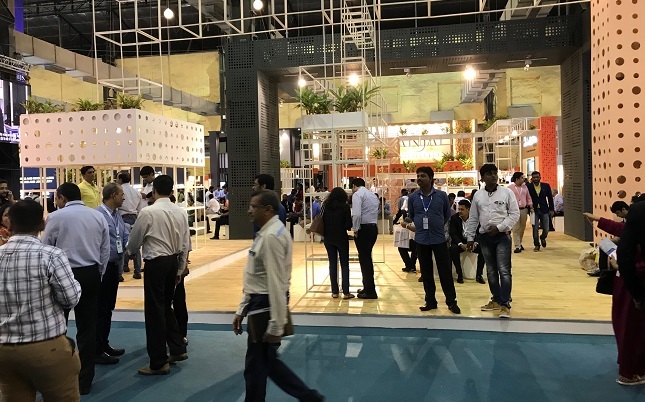 We have seen many buyers from the south and east of India, and more buyers than on the first day of the show last year. "Larger diamonds, of 1 carat and up, are seeing a lot of interest, and mixed parcels are also doing well. We have seen representatives from the big retailers who wanted to be here on the first day before it gets really busy over the weekend," he added. Meanwhile, Pratik Shaha of Rosy Blue said. "I would not say that we had seen many new entries to the booth, it was more a case of existing clients. They have shown interest in a wide range of goods in sizes and clarities. I would say there were few new clients but more a case of existing customers showing up. Maybe they are planning to come on Friday and Saturday." Earlier, speaking at the inauguration, Agrawal said that the GJEPC was working very closely with the government to achieve its vision of adding 2 million jobs in the sector and increasing exports to US$70 billion by 2022. It has begun a survey to map the manpower, capability, skill level and competency of key gem and jewelry centers across the country to develop appropriate action plans, the GJEPC said. Congratulating the Council for its efforts, Cavalieri said that CIBJO and GJEPC have worked closely together, and would continue to do so, while stating that “the global jewelry industry cannot march forward without the valuable inputs from a country like India”. Vice Chairman Colin Shah unveiled the GJEPC’s new promotional campaign which emphasized elements such as the gem and jewelry industry's contribution to India's GDP, the employment it creates, and welfare schemes for workers.